YWCA NorthEasternNY Early Learning Center Programs have provided quality licensed child care for women and their families since 1985. 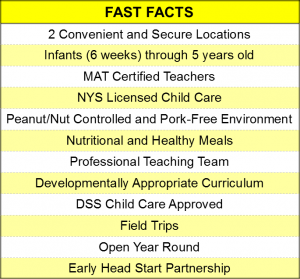 Currently both centers are NAEYC (National Association for the Education of Young Children) Accredited and voluntarily participate in QUALITYstarsNY. 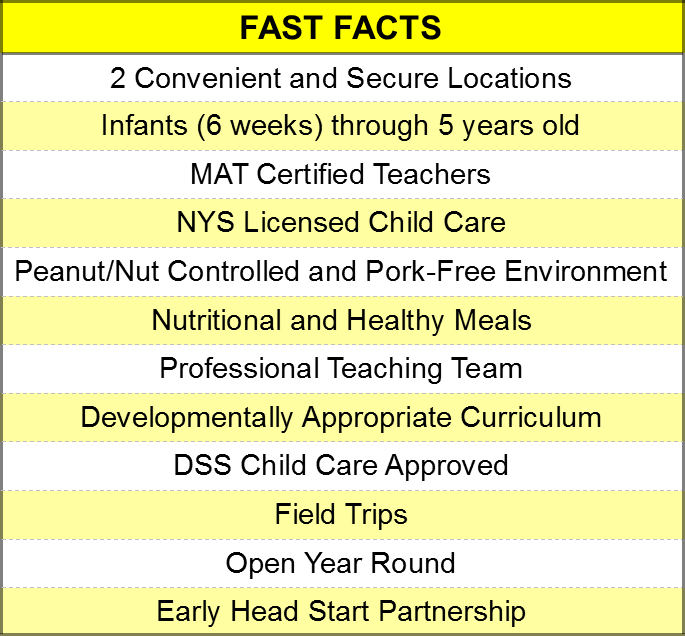 Both sites provide Early Head Start in the infant and toddler rooms. Each center has a developmentally appropriate curriculum (Creative Curriculum), a learning environment focusing on the emotional, physical and cognitive development of children from six weeks to five years old. While providing families with high quality early learning centers, the YWCA NENY is able to provide parents with a safe place for their children while they continue their education or work to support their families. We have openings in both locations! To find out more about our staff and certifications, click here. To find out more about our classrooms, click here. To find out more about our nutrition program, click here.